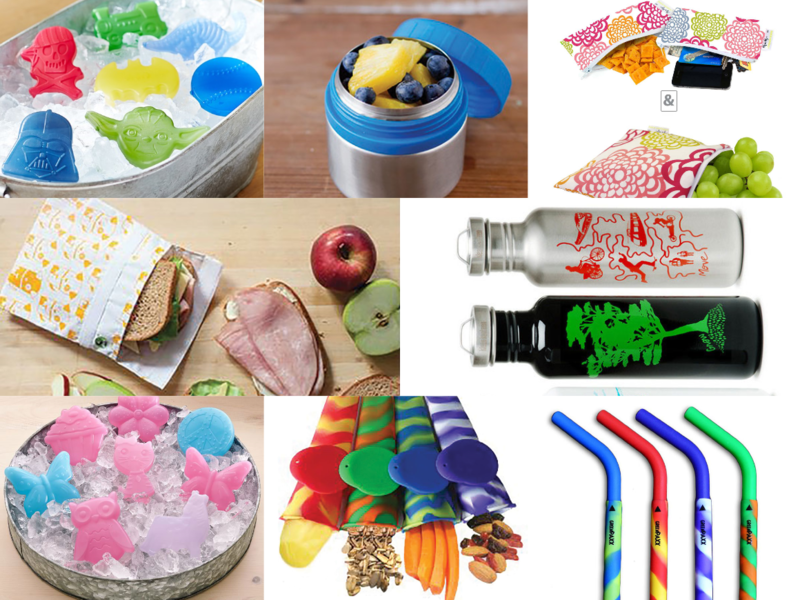 You want toxin-free and eco-friendly lunch boxes; your kids just want fun patterns, themes and colors. 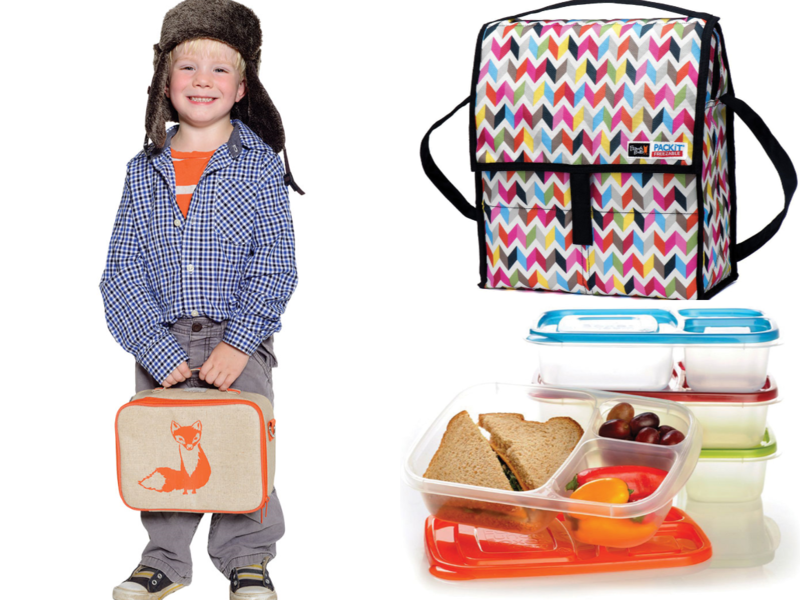 With a slew of new green lunch box options out there, it’s easy to make everyone happy. We’ve rounded up nine of the best pieces of food gear, including retro hipster lunch boxes, stainless steel bento boxes, reusable snack and sandwich bags, new thermoses and even silicone straws. Get it and pack it: fun — and done! Made of EVA-coated linen with a palette of retro-inspired designs to suit every taste, SoYoung lunch boxes are cool enough for the smallest hipster. Wear it backpack- or messenger-style for hands-free carrying. Comes with a leak-proof, insulated insert for easy cleaning, and an extra back pocket for cutlery and love notes! Free of PVC, phthalates, lead, BPA. Keep it cool by using lunch boxes with a patented freezable gel built right into the liner of the box itself. Just fold the lunch box flat, freeze overnight and pack the next day. We love this bright chevron print, but there are many other fun patterns to choose from Packit Ziggy. Ziggy also offers other shapes, such as a square box — perfect for salads or fresh veggies. PVA-, phthalate-, lead-free. This best-selling bento set includes three containers that nest together, allowing you to pack a lunch that keeps foods separated without squishing! The lower container is big enough for a small sandwich, and the top one can hold veggies plus a snack pod for dip or other items. 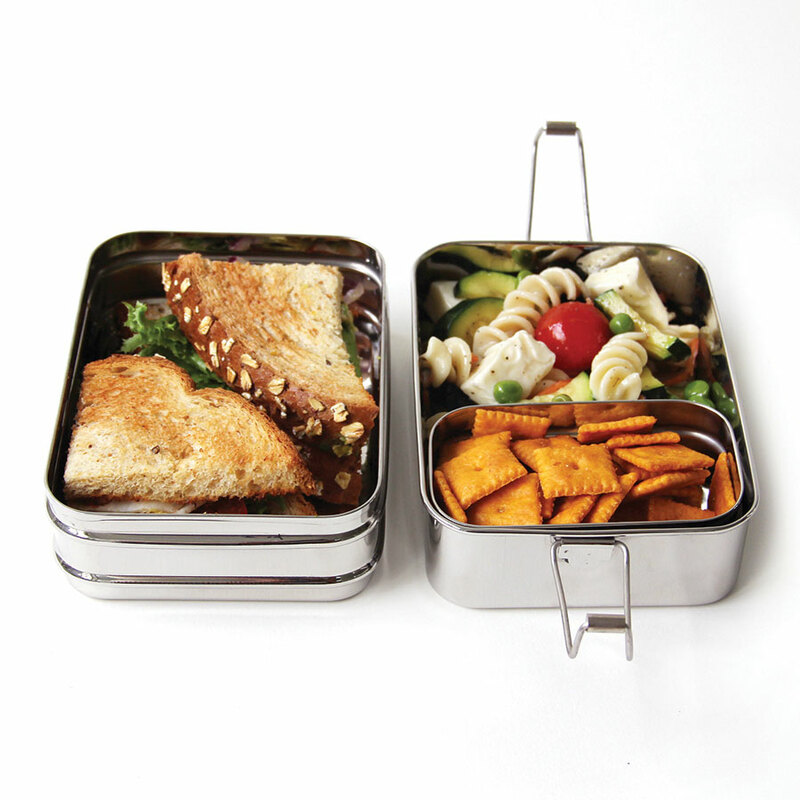 The Ecolunchbox is made entirely of stainless steel with no plastic, so these are not leakproof. The clips can be adjusted to be looser for easy opening by little hands. 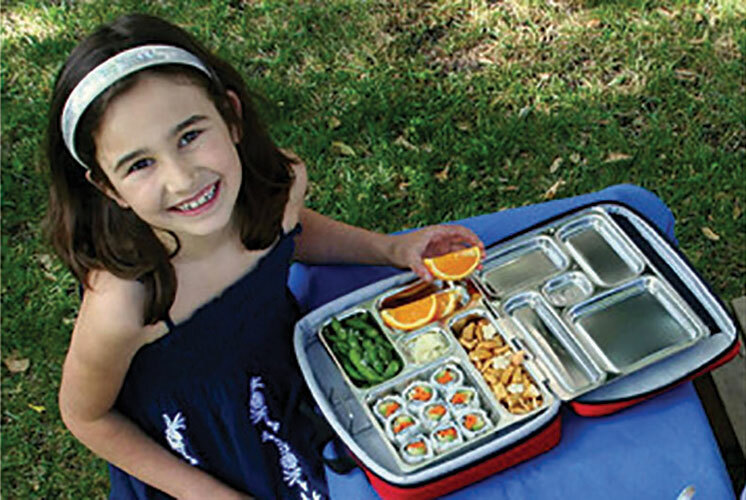 PlanetBox offers these cool TV-dinner-like stainless steel lunch trays in three different sizes. The largest holds 6 and a half cups of food, and the smallest holds 3 cups. The complete set comes with a removable glass Satellite Dish container for reheating foods, a Tall Dipper (a stainless steel round container with leakproof silicone seal for dips and yogurt), magnets to personalize the tray and a sleeve to carry it all. You can purchase various accessories, such as a freezer pack, reusable utensils and extra magnets for decorating. Out of this world! 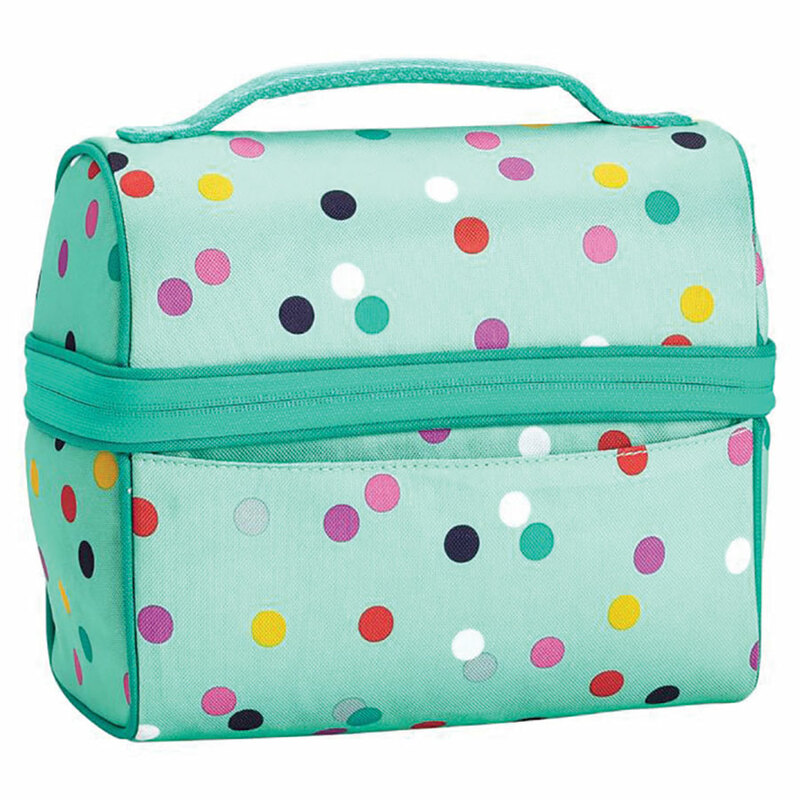 This cool retro lunch bag from Pottery Barn Teen not only looks great at the lunch table, but the lining is made of PEVA, an environmentally safe, food-safe vinyl made without plasticizers, phthalates or chlorine. The roomy interior features a mesh pocket for a water bottle or food container. The polyester outer shell features exclusive prints. We love this one, but if you (or the tween) don’t, there are plenty of other designs to choose from. For an economical choice in a reusable lunch box, these bento boxes are the number-one seller in lunch boxes on Amazon. The three containers nest together when not in use (helps keep those cupboards less chaotic! ), and each box has three compartments. The lids fit snugly but not too tightly, making them easy to open. However, the easy-open feature means they’re not leakproof, so runny foods or liquids are not recommended. They’re made without phthalates, BPA or PVA, and are microwave-, dishwasher- and freezer-safe. Pair with an EasyLunchboxes cooler bag, available in seven colors. 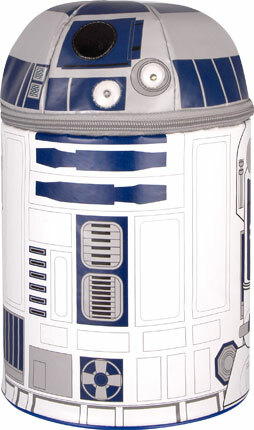 The Force will be with the one who carries this novelty lunch box! Not only does this Thermos-brand box have a push button for sound and light effects, it’s PVC-free with environmentally friendly PEVA lining. Check out the whole line for other Star Wars–inspired lunch kits. In a cafeteria far, far away, your child will be very happy. Clockwise from left: Pottery Barn Kids Freezer Packs, LunchBots insulated thermos, Itzy Ritzy Snack Happens, Lunchskins, Klean Kanteen graphic collection, Pottery Barn Kids Freezer Packs, GreenPaxx Slim Snacks, GreenPaxx Silicone Straws. Pack snacks and lunches without using plastic with these stainless steel containers, which have a BPA-free polypropylene lid with silicone seal. The lids twist off, making them easy for kids to open, and they’re completely leakproof. Bots rounds come in a rainbow of colors, in both 4- and 8-ounce sizes. Best of all? They can go into the dishwasher! Don’t forget a thermos for hot lunches on the go! LunchBots offers stainless steel thermoses in 8-, 12- and 16-ounce sizes. The special extra-wide design provides easy access to rice, noodles, chicken, oatmeal or whatever else you cook up. It’s leakproof, and the lid is BPA-free with a silicone seal. This chunky thermos keeps food hot for as long as five to six hours and cold foods cold for six to seven hours. Hand-wash only. Tired of using plastic snack bags for crackers and carrot sticks? Try these reusable snack bags from Itzy Ritzy. The Everything Bag is a generous 7 by 7 inches, and the minis measure 7 by 3.5 inches. Perfect for healthy snacks, these bags are PVC-, phthalate- and lead-free. Not only can you machine-wash them in cold water, but the vast array of patterns and colors means you won’t even be tempted to go back to boring plastic! Lunchskins are toxin-free, dishwasher-safe, durable and reusable snack bags created by three green-minded moms who wanted to make a difference. Now 3GreenMoms have teamed up with PBS Kids to create a line of reusable food keepers. Bags will be sold at Whole Foods Market and online at shop.PBSKids.org. Not only will these bags reduce the amount of plastic in the landfills and please your hungry monkeys, but Whole Foods will donate 1 percent of the sales, up to $25,000, to the Whole Kids Foundation, an organization dedicated to improving kids’ nutrition. Jazz up the lunch box with Slim Snacks by GreenPaxx. These cone-shaped silicone ice pop molds aren’t just for Popsicles. They feature a reinforced, attached cap (so the kids don’t lose it!) that is perfect for everything from applesauce to smoothies. These make great holders for dry snacks as well, and the slim shape makes it easy to fit into lunch boxes and diaper bags. We all know that plastic water bottles aren’t the best, but the stainless steel variety can be a bit boring. Klean Kanteen offers three different graphic designs for its signature stainless steel water bottles. These hold 27 ounces and come with the cap. The wide mouth is big enough to add ice cubes to your drink (especially nice for athletes and superactive kiddos), and the food-grade stainless steel won’t leech flavors into beverages. No lead, PVC, or other toxins, and these are dishwasher-safe. Kool. Save the day with these small ice packs, which fit easily into any lunch kit. Pottery Barn Kids offers a variety of packs, from Star Wars characters and superheroes to butterflies and flowers. These come in sets of two and are BPA- and phthalate-free. If you have a kid who enjoys drinking from a straw, try these reusable silicone straws from GreenPaxx. They are nonplastic and free of phthalates, PVC, BPA and lead. They can even be boiled for sterilization, or just knead under hot water to clean. Gulp! Clockwise from left: SoYoung shark backpack, Land of Nod elephant backpack, Lego lunchbox, Kånken by Fjällräven, Owl pack from Bixbee. 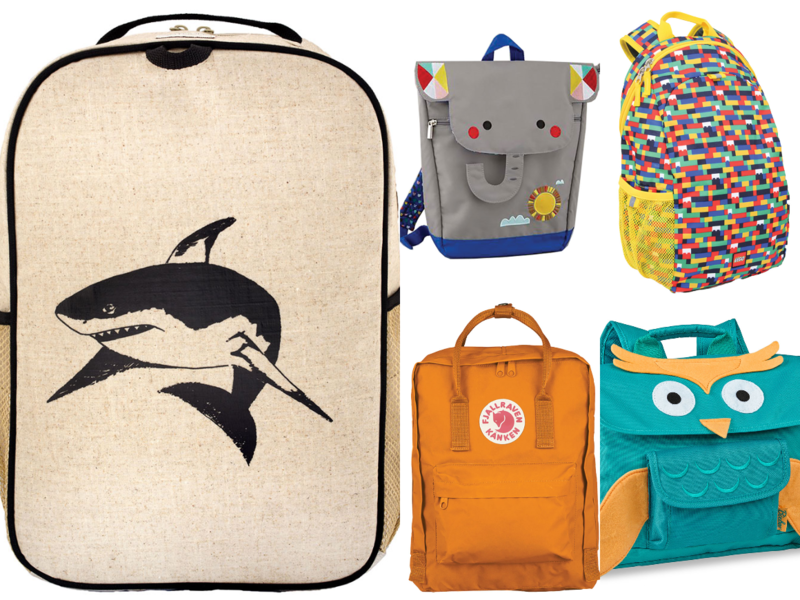 Every week is shark week with this hipster-worthy big-kid pack from SoYoung. These bags feature a laminated linen exterior, are toxin-free and designed in Toronto. If sharks aren’t your thing, try an orange fox, brown horse, blue robot or pink Russian nesting dolls. Even teens will dig ‘em. Your kid adores Lego, so these bright bags are a match made in heaven, from classic bricks to Ninjago. Originally made for Swedish schoolchildren in 1978, the Kånken by Fjällräven is going to look right at home on Pacific Northwest playgrounds this year with its bright colors and moisture-repelling Vinylon F fabric. 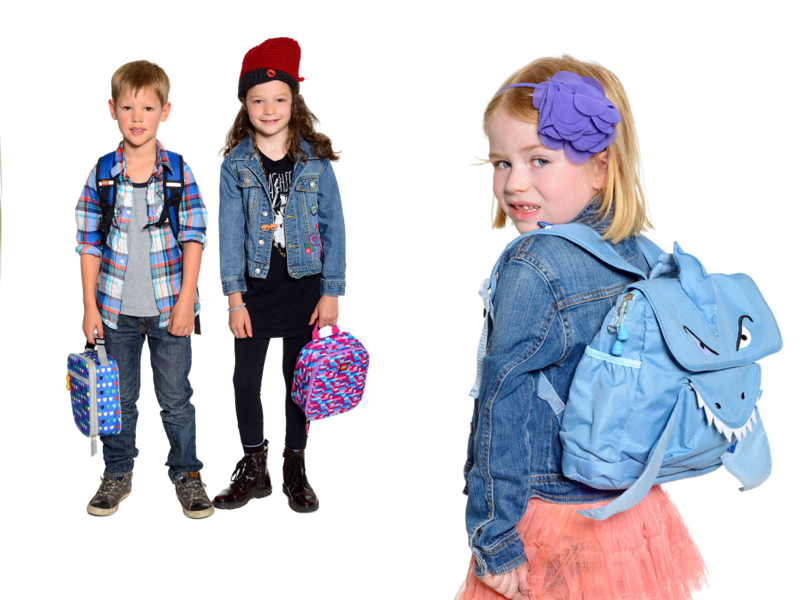 Cool for tweens; also comes in a mini size perfect for teeny tots. Why not let them show up to school with a wild animal on their back? You can, with the teacher’s pet backpacks from Land of Nod (elephants, lions and whales, oh my).